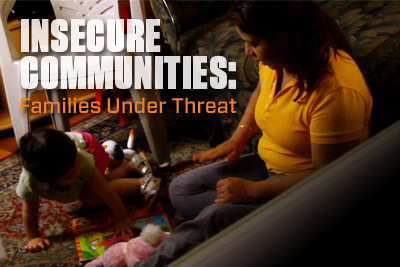 “Insecure Communities: Families Under Threat” is a poignant 12 minute film documenting the dangerous effects of Immigration and Customs Enforcement (ICE) programs that place local police at the center of immigration enforcement. The film follows Djibril, Maria, and Jose, whose lives have been impacted by programs such as Secure Communities (S-Comm) and who now fear being separated from their children and families. “Insecure Communities” is a stark reminder that every day communities are broken up because of unjust and immoral immigration enforcement programs with many more living in fear that they may be next. This entry was posted in Media, Organizing Resources, Resources, Video on May 6, 2011 by Ian.